I’ve had this picture for 15 years now. You probably know the guy on the right – that’s Stan Musial. 24-time All Star,* 3-time MVP, 3,000 hits, 400 home runs, first ballot Hall of Famer. The guy on the left is Tommy Holmes. I met him in the summer of 2000, my first year at the wonderful Summer Trails Baseball Camp. Every year, they’d get a few former baseball players to come in, talk to the kids, give a demo, and sign autographs. Holmes was signed by the Yankees in 1937 and played on the 1939 Kansas City Blues, which also featured Phil Rizzuto and Vince DiMaggio. Joe Posnanski recently called that the greatest minor league team in baseball history. On December 9th, 1941 – just two days after Pearl Harbor – he was traded to the Boston Braves, where he would play for the rest of his career. He was one of the finest baseball players of his generation. In 1945, he led the league in hits, doubles, home runs, and slugging percentage. He finished second in the MVP voting behind Phil Cavarretta. * My favorite stat about that year: Holmes struck out nine times. Nine! He was one of the greatest contact hitters in baseball history – in almost 6,000 plate appearances, he struck out a grand total of 122 times. In 2014 alone, 58 players did that. *Cavarretta shouldn’t have won. It’s an all-time snub. Sure, he hit three points higher (.355 to .352) and had a higher on-base percentage. But he also had 25% fewer plate appearances, hit with no power, and was one of the worst defensive first basemen in the game. I don’t care that it was 70 years ago, it’s wrong. 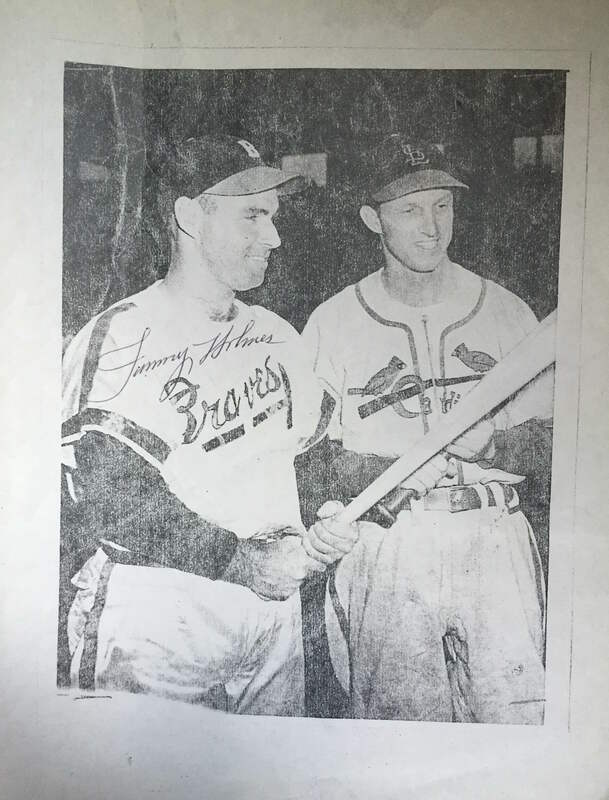 Holmes’s 1945 season might best be remembered for his 37 game hitting streak, a record that stood in the National League until Pete Rose broke it 33 years later. Of course, meeting Tommy Holmes and getting his autograph was a great thrill, but here’s what I remember most: he was old. He was in his eighties, but he looked even older. He was frail, he had spots all over his skin, he had trouble walking. He had a noticeable hump. He talked in a quiet and high-pitched voice and it seemed like he ended every sentence with the word boom. Always keep your eye on the ball, boom. Make sure to keep your hands in, boom. Remember to bend those knees. Boom. He came back again in 2001 and 2002, and each year he looked even older, to the point that Alex and I would check the internet (daily) to see if he had died. We’re weird people. Holmes, of course, did eventually pass away in 2008 at the age of 91. That’s the way it was out there. They would do practically anything for me, and I never forgot it.